#5 Two Way Separating Zippers are basically the same as a Finished Zipper except the 2-Way Zipper allows you to open the bottom portion of the zipper while the top portion is still zippered allowing the wearer easier access to inside pockets, ventilation and relief restrictive movement. These zippers are most commonly used for jackets, sportswear, & outerwear. 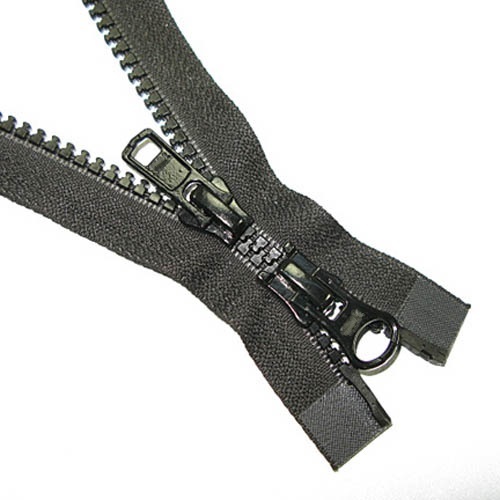 #10 Two Way Separating Zippers are basically the same as a Finished Zipper except the 2-Way Zipper allows you to open the bottom portion of the zipper while the top portion is still zippered allowing the wearer easier access to inside pockets, ventilation and relief restrictive movement. These zippers are most commonly used for jackets, sportswear, outerwear, rainwear etc.